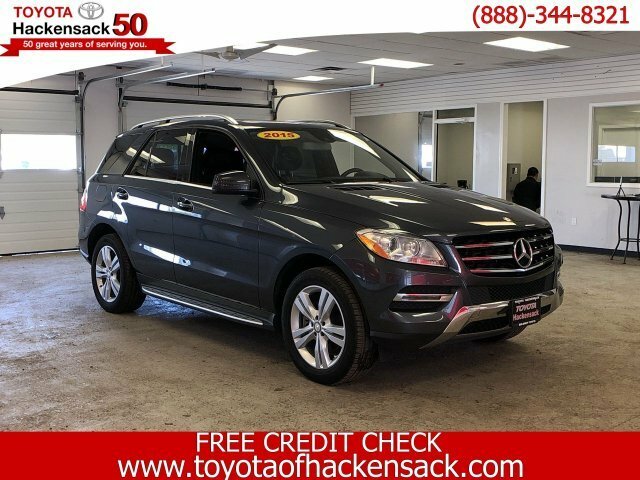 Steel Gray Metallic 2015 Mercedes-Benz M-Class ML 350 4MATIC 4MATIC 7-Speed Automatic 3.5L V6 DOHC 24V 4MATIC , Black w/MB-Tex Leatherette Seat Trim. The 2015 Mercedes-Benz M-Class is available in four different models: the ML350, ML250 BlueTEC diesel, ML400 and high-performance ML63 AMG. The ML350 is standard with rear-wheel drive, with optional 4MATIC all-wheel drive, while 4MATIC is standard on the rest of the range. The ML350 comes with a 3.5L, 60-degree V6 with high-pressure direct injection, which results in 302 horsepower. The ML250 BlueTEC features a 2.1L turbocharged diesel 4-cylinder that delivers 200 horsepower and an impressive 369 foot-pounds of torque. The ML400, meanwhile, benefits from a 329-horsepower turbocharged 3.0L V6, while the ML63 moves courtesy of a hand-built 5.5L twin-turbocharged V8 making 518 horsepower and 516 foot-pounds of torque. All M-Class engines are mated to a 7-speed automatic transmission with paddle shifters. The ML250 BlueTEC includes special electronically adjustable hydraulic engine mounts that make the driving experience far smoother than virtually any other diesel. The ML63 AMG will run from 0 to 60 mph in just 4.6 seconds, with a top speed of 174 mph. It comes with details such as a carbon fiber engine cover, painted brake calipers and a special steering wheel. The M-Class models have only two rows of seating and can accommodate up to five adults. They're packaged much like other SUVs, which is to say that rear seatbacks fold forward -- along with the lower cushions here -- to expand the cargo space up to 71 cubic feet. When the center position of the back seat isn't being used, there's a fold-down center armrest and cupholder. All four outboard positions in the M-Class are excellent and supportive -- contoured for adults and comfortable enough for all-day travel. Upholstery is available either in a combination of MB Tex synthetic and a microfiber or in leather. Ride quality of the M-Class is smooth, quiet and absorbent, yet steering response is quite sharp. Among the M-Class' many active and passive safety features offered are Lane Keeping Assist, Blind Spot Assist, a Night View Assist night-vision system with pedestrian detection, Distronic Plus adaptive cruise control, a Pre-Safe Brake system that will help brake if a collision is anticipated and a special lighting package. Attention Assist studies patterns in the driver's fine steering adjustments, can identify fatigue and drowsiness, chiming and flashing a coffee cup icon on the instrument panel. Mercedes-Benz' COMAND screen-based interface is standard, including a 7-inch display, Bluetooth audio and hands-free calling, cover-art display, a USB port and a 6-disc changer. Meanwhile, the instrument cluster has its own reconfigurable, 4.5-inch display. With the Premium I Package, a navigation system with 3D city models and Sirius traffic and weather integration is included. A special dealer-installed iPad docking station also lets an iPad integrate with the audio system. For 2015, Mercedes has downsized a couple of their engine options in hopes of increasing fuel economy. The BlueTec Diesel offering is now a 2.1L 4-cylinder and the V8-powered ML550 now features a turbocharged V6 and has been redubbed the ML400. The 2015 Mercedes-Benz M-Class is one of the most refined, most comfortable, and safest luxury SUVs available. It's also surprisingly fuel-efficient -- especially in ML250 BlueTEC diesel guise. The M-Class' interior has much-improved materials and detailing compared to the previous version, and it's now one of the most lavish cabins in its class. An off-road package for several different modes of trail driving is available and allows for ground clearance of up to 11.2 inches and a water-fording depth of 23.6 inches. The package also includes a locking center differential and a 2-speed transfer case.